While I was in Sapporo, the Beer Festival was on. In addition to beer gardens every night in the park. 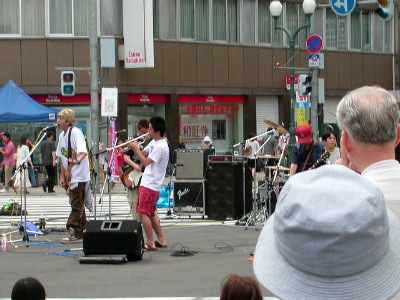 There were also bands in the street, at least on the last Saturday of the festival. They were actually pretty cool. The trumpet player was also the singer. They were pretty heavy. Lot's of other bands played, I only watched a few. This was the best of the bunch, and the last of them too. Yes it shut down traffic on the busiest intersection in town, which was also cool.